Development: The GCaMP8.1-mVermilion fusion protein was inserted at the ATG site of the acta2 gene in the BAC RP23-370F21 (CHORI) through homologous recombination. The resulting recombinant BAC was injected into the male pronucleus of fertilized oocytes which were then implanted into pseudo pregnant females. Resulting offspring were screened for the presence of the transgene (founders). Colonies were established from each founder and tested for expression. Description: The genetically encoded calcium indicator GCaMP8.1-mVermilion is expressed under control of the acta2 promoter, directing expression to smooth muscle cells in various organ systems including blood vessels, airways of the lung, gut, bladder. Expression may be present in other smooth muscle containing tissues which have not been examined. GCaMP8.1 is modified from GCaMP8 and includes codon optimization for mouse and one mutation M144I in the calmodulin portion of the protein resulting in a lower kD. mVermilion is an mCherry derivative with approximately a 2 fold brighter emission. GCaMP8.1 responds to calcium levels in the cell. When calcium increases, a conformation change occurs resulting in an increase in fluorescence. When calcium decreases, fluorescence decreases. mVermilion remains at a constant level, allowing for ratiometric measurements of calcium signaling in various smooth muscle containnig organ systems. 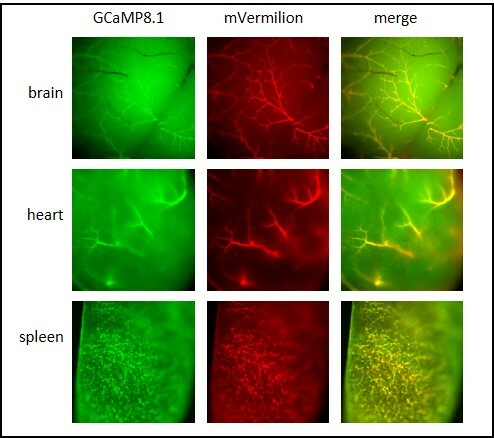 acta2-GCaMP8.1-mVermilion expression in vessels in brain, heart and spleen. So as to appropriately acknowledge and credit the scientists who have produced the acta2-GCaMP8.1-mVermilion mouse strain, it is expected that you will include these individuals in any publication that is submitted prior to the initial publication of this line from the Kotlikoff laboratory. The mouse strain acta2-GCaMP8.1-mVermilion was developed by CHROMusTM which is supported by the National Heart Lung Blood Institute of the National Institute of Health under award number R24HL120847.